It’s back-to-school time, time for more soups and cool-weather eats. Carrots make us think of Bugs Bunny, hence the title of this post, but by eating well we hope we can stay out of the doctor’s office and enjoy all that fall has to offer. Carrots are famous for their beta carotene, or Vitamin A, allowing us to “see in the dark.” Beta carotene helps protect our night vision in particular, and as an antioxidant may decrease risk for certain diseases, although the specific research remains limited. This crunchy, sweet orange snack is also low in calories, high in fiber, Vitamin K, Vitamin C and potassium. For the recipe, we took inspiration from the 101Cookbooks blog, but modified things a bit. Wash and/or peel your carrots and chop them up into bits. Place those bits aside. Into a big pot – we call ours The Vat – on medium heat, warm 1 Tbsp. extra virgin olive oil. To that, add 1 chopped yellow onion, 2 finely chopped garlic cloves (or 2 frozen garlic cubes). About 1 Tbsp. 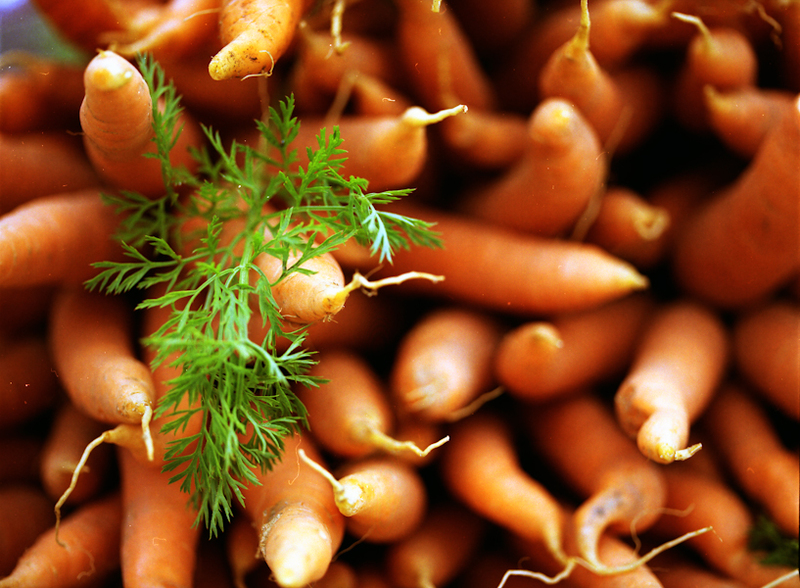 oil should be enough for 1 ½ to 2 pounds of carrots. Add in the chopped carrots and 4 cups of soup stock and/or water once the garlic and onion are softened. For stock, we often purchase the “Low Sodium” version of chicken or vegetable stock that you can find in a box in the soup aisle. Cook for about half an hour, until the carrots are plenty tender. Remove the pot from the heat and puree with an immersion blender if you like your soup chunky, or dump it in the blender if you’d like to puree it smooth. 101Cookbooks suggests adding juice of ½ of a lemon, more if you like, and then salt it to taste. Once the soup cooled, we froze it in 1-cup containers. It can also be frozen flat in zippered baggies. This carrot soup recipe is as easy to make as it is easy to modify. If you’d like to make baby food, cook only the carrots and puree them. For an adult palate, try adding in pepper, or even some peeled Granny Smith apples cooked al dente. Check out Every Food Fits next week for more recipes and nutrition information for our favorite autumn foods! How Stacey Got the Shot: On Kodak Vibrant Color film. ISO 400. At the Penn Quarter Thursday farm market. Aperture was probably around f/4, which is as low as it’ll go on the 80mm macro lens on Mamiya 645 medium format camera. Slice baby carrots in half, sautee in olive oil and butter till tender, add garlic, make a sauce with Dijon mustard and a bit of brown sugar, then serve with minced chives or herbs de Provence. What a brilliant photo!! WoW!